Unexplored Territory, our first anthology of poetry and fiction, was launched on 15 November 2012 at the Beaney House of Art and Knowledge, Canterbury. We were delighted that Nancy Gaffield, who has endorsed the book, gave an introductory speech before the readings. It is reproduced below. Nancy is the author of Tokaido Road, winner of the Aldeburgh Prize for first collection 2011. You can buy a copy of Unexplored Territory by clicking here. I’d like to congratulate Maria McCarthy and Bob Carling on the publication of Unexplored Territory—Poetry and fiction from Cultured Llama, along with all of the writers whose work appears in this outstanding new anthology. Maria tells me that the idea for the book began as a ‘sampler’ of the kind of writing (both poetry and fiction) that Cultured Llama publishes, so the idea is that the anthology would encourage readers to obtain the full collections. And you should—you must! No theme was set—the sole criteria being good writing. Work could be published or unpublished; it contains both well-known authors and new names. Its 17 contributors come from Kent, and further afield, with some writers having roots in other countries: the USA, Guyana, and Ireland. This makes for a diverse read, and yet the entries are connected in such a way that the whole flows seamlessly, each piece intent on offering a detailed observation of the unexplored territory of the human heart. Hats off to Maria for that. Now that the book is in print, I think you will agree too that the beautiful design [by Maggie Drury] is a worthy indication of the treasures inside. What you will discover here is a cornucopia of fiction and poetry, a unique collection from an eclectic group of writers. Compelling stuff: the stories and poems attest to the elegance, eloquence and endurance of the personal voice. 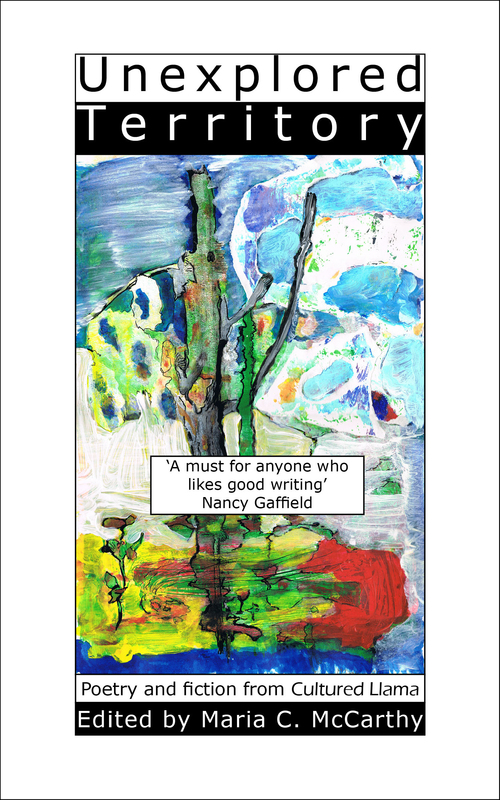 You are currently reading Nancy Gaffield introduces ‘Unexplored Territory’ at Cultured Llama.